Steve's musings on life, godliness, and other things. Do you know why God seems so absent sometimes? There are several reasons, including (among others) the fact that perhaps your God wasn't really THE God, but just one of the many gods -- a mask created by imagination and worn by beings with more will to power than you. However, when all the gods are shown to be idols, and all the masks stripped away, there really IS an empty place. THE TRUE GOD is completed uncreated, unapproachable, incomprehensible. He is not "A GOD." He is the Unknown God. But the fool sees this and says in his heart, "There is no God." So why does He choose to act like this, even to the point where His own beloved Son cries out, in His moment of deepest need, "My God, My God, why hast thou forsaken me?" He made us truly free agents. Morality really is a social construct. When you get right down to it, Nietzsche was largely correct, and willpower wins the day. Often, in the Protestant milieu, one hears such things as, "The Bible says ... ", followed by their pet heresy or denial of the Truth. This is patent silliness. The Bible doesn't "say" anything. It just sits there on the desk. Opened or closed? Doesn't matter, although in many cases it is closed anyway! The Bible does not speak, but the reader. The Bible itself (I mean the book with pages that sits on your desk) is but impressions of ink on paper. It is the reader that speaks, or the one who gives the interpretation also, not the Bible itself. One might object, of course, to my blatant pedantry. Why am I being so silly? When colloquial understanding is in accord with Truth, one need not dig deeper and examine the usage. But when it is turned against the Truth, as this kind of statement often is, precision of language is paramount. Here's why it's a big deal. At one point, I studied, absorbed, and even kind of believed the teachings of an early 20th century philosophy known as Perennialism, or The Traditionalist School. (The two are not the same, but they are interrelated, and for the purposes of this post, we will treat them the same. The basic tenet is that all of the major religious traditions, at their best, lead to or impart knowledge of the Transcendent, commonly known as "God", even if they disagree with each other, they do so because God set it up that way. Well the funny thing about the Traditionalist school is that it furthermore posits that to actually acquire the knowledge of that transcendent reality from the major traditions, you have to PICK ONE. You can't smorgasboard or cherry-pick or try to learn from all of them, but you have to pick one, enter into it, and forget the rest. I encountered the following on Facebook. Make everyone's vote count equally. Eliminate the Electoral College. Do you agree? I actually propose restoring the electoral college to it's original glory, first by removing the state-by-state requirements that have cropped up requiring all electors from a State to vote according to the popular vote in that State, and secondly by requiring the national vote to be for the electors in each State (as far as the People can appoint them -- some would be appointed by the Legislatures, of course), and NOT for the Presidency. This would cause the national vote to work as intended originally -- a Republic, not a Democracy. I also, of course, advocate for the repeal of the 16th and 17th Amendments -- again, to restore the Republic to functioning AS a Republic. If you are not familiar with Scott Adams' How To Identify the Brainwashed, in which he goes over the "tells" that a brainwashed person will display when discussing a topic, you should be. One of the tells listed is "OMG", followed by either sarcasm or no argument at all. 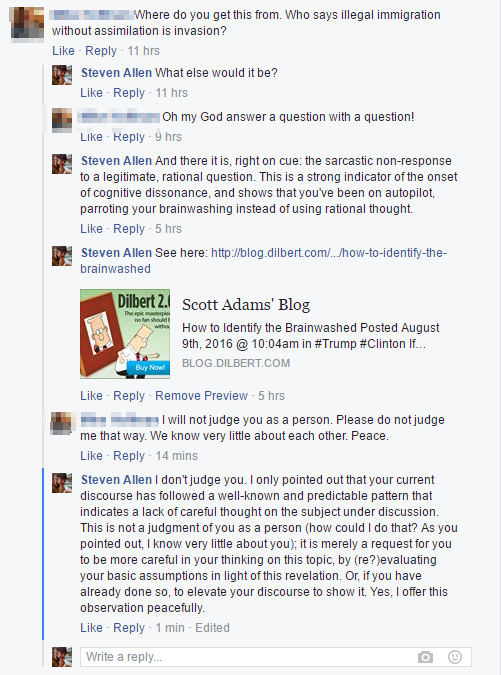 Earlier in the debate (here is the full debate, for reference), I had been using variations on Mr. Adams' techniques for How To Un-Hypnotize a Rabid Anti-Trumper, so it doesn't surprise me that I got a result he has encountered, but it was still thrilling to see it "in the wild". And of course, my interlocutor immediately took it as a personal insult that I would point this out to him, in spite of the fact that we are all brainwashed in one way or another. I guess I hit a nerve?